The private foundation of paypal co-founder Peter Thiel funds radical ideas with huge potential for positive change. People with more money than most of us could imagine are throwing their philanthropic weight around in different ways. Jeff Skoll, co-founder of eBay, supports social entrepreneurship around the world. Microsoft co-founder Bill Gates takes aim at poverty and global health. Virgin Group founder Richard Branson finances clean-energy initiatives and leads efforts to make capitalism more environmentally and socially responsible. Then there’s PayPal co-founder Peter Thiel, who is putting his faith in breakthrough technologies. Thiel made his first fortune after selling PayPal, the popular online payment service, to eBay in 2002. He then founded global macro hedge fund Clarium Capital to build on that wealth. But it was his $500,000 investment in Facebook in 2004 that eventually launched Thiel, now 45, into the billionaire’s club. The transaction bought him a 10.2 per cent stake in the massive social network, shares of which he sold for more than $1 billion after Facebook went public. An asset manager, angel investor and venture capitalist, Thiel also devotes a significant amount of his fortune to what he calls “breakthrough philanthropy” – radical ideas around technologies, government and human affairs. He has, for example, funded an organization called the Seasteading Institute, which wants to build autonomous, isolated ocean communities that will test new social, legal and political structures. To encourage creative and independent thought, his Thiel Foundation gives out up to 30 fellowships annually – each valued at $100,000 – to students under 20 years old. But there’s a catch: the winning students must agree to drop out of college for two years to pursue their own work – be that starting a company, building a social movement or engaging in a new area of scientific research. And then there’s Breakout Labs, a program the Thiel Foundation launched in late 2011, which is described as “a revolutionary, revolving funding model where successful projects fund the next generation of audacious scientific exploration.” Breakout Labs offers grants of up to $350,000 to scientists and inventors who are taking unconventional approaches to solving major global challenges, from cancer therapy and sustainable food production to clean energy and environmental health monitoring. One of its most recent grants was to a company called Avetec, which is seeking to generate emission-free electricity from tornadoes created from the waste heat of power plants. Another grant recipient is Modern Meadow, a company that employs 3D technology to “print” meat and leather using animal cells replicated in a lab – a way to make products and proteins without the need to kill cows, pigs and chickens. Many may question his methods and his definition of progress, but there’s no question that Thiel’s willingness to embrace the radical is rare and welcome. CK: Why was the Breakout Labs program founded? FISHBURNE: It’s essentially set up as a revolving fund to help get funds into very early-stage, extremely innovative, ground-breaking technology and science companies. The hope is our money can be a catalyst that helps them move forward against very specific scientific milestones. It could be a proof of concept. Or, at the intersection of biology and technology, they could use the funds to pursue their own animal studies, which can take them from hypothesis to getting data that supports the outcomes they hope for. CK: Isn’t that the role that government typically plays, or is this filling a new need? FISHBURNE: There’s a gap where government doesn’t get engaged. Maybe it’s still too theoretical and there’s not enough data to get engaged on. 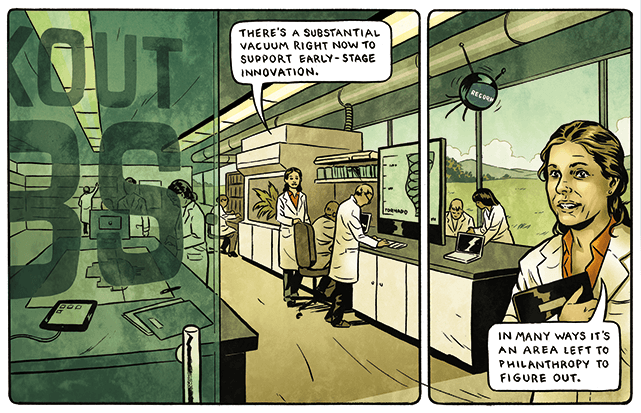 The big joke in the U.S. with our National Institutes of Health funding is essentially you have to do the work, then you apply for the grant, and the grant then pays for the work you already did. The issue is that you already have to have achieved a certain level of data to attract that funding. CK: There must be an element of groupthink there as well. FISHBURNE: Yes, it’s also about the conventional ideas and politically approved ideas – what discipline is saying is the winning theory. Those are the ideas that get approved. It’s very hard to get that funding when you’re operating outside of a university setting, on your own, if you don’t necessarily have the academic track record or the connections and right advisor. Or if you’re working at a new intersection of disciplines and bringing different thoughts together. Maybe you’re debunking a conventional belief. Those are very hard projects to get funding for. One of the companies we funded is working on a whole new way of preserving organs for transplant. If they succeed, organs will have a much longer usability life for a transplant, but that’s not something traditional government is going to support. Yet if we make progress there, the impact is extremely meaningful. 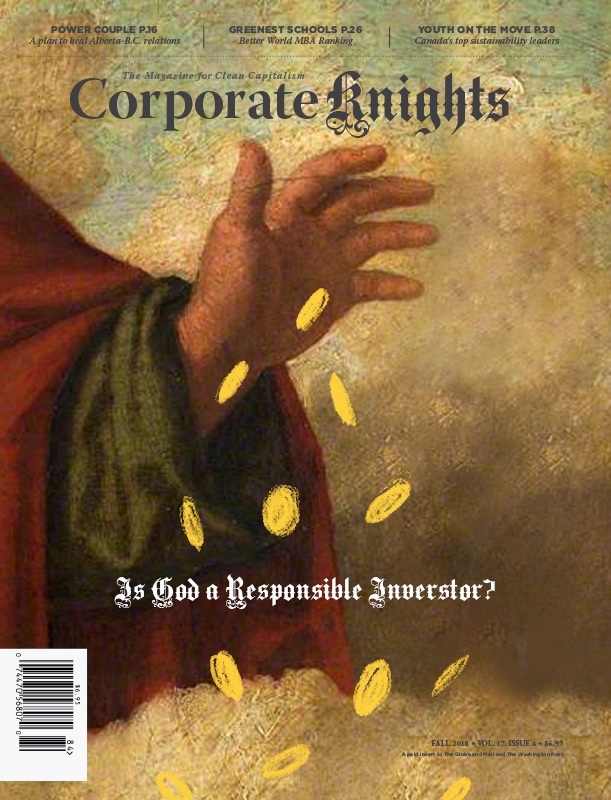 CK: This issue of Corporate Knights is exploring the idea of whether we as a society need more super-rich private citizens to throw their financial weight behind world-saving initiatives or scientific ideas. Do you think we do need more billionaires, like Thiel, to step in to fill a void left by government and the private sector? FISHBURNE: I do. I think you’ll see more folks engaging there with direct investment and philanthropic investment. There’s a substantial vacuum right now to support early-stage innovation. We had substantial dollars there in the last two decades that moved ideas forward, but for a variety of reasons and challenges you’ve really seen the venture industry leave early-stage innovation behind. By the time they get involved, an idea needs to have typically millions of dollars poured into it and lots of data collected, and be ready for commercialization. So what you’re finding is really a revolution in philanthropy; you’re seeing all different types of foundations getting engaged trying to move early-stage ideas forward, faster. In many ways it’s an area that’s being left to philanthropy to figure out. CK: Presumably you get hundreds of companies submitting proposals for grants, many with ideas that are quite “out there” – such as your recent funding of Avetec, the company that wants to create electricity-generating tornadoes out of power plant waste heat. How do you whittle your final choices down to just three in every round? FISHBURNE: Each proposal is weighed on its own merits, initially. In our first year, our sweet spot really was at the intersection of biology and technology, but we would like to be active across a range of advanced technologies. When something like Avetec comes along, for a relatively modest amount of money (founder Louis Michaud) can build a working, functional prototype that he’ll learn from, and from there it’s easier to see what a path to a trial implementation with a power plant will look like. The fact that our money can be a catalyst for this project and that the impact could be so significant is what makes it a compelling place for us to play. CK: What’s in store for 2013? FISHBURNE: It really just depends on the flow of proposals and the quality. We’re looking to do 12 companies again next year, but the timing is not prescriptive.